Are you a yoga teacher? Sign-up to create your own lists of yoga poses using our yoga class planning software. Are you a yoga teacher? 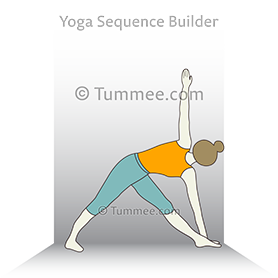 Try yoga sequence builder to create your own visual library of yoga sequences. Join your fellow yoga teachers! In Sanskrit, ‘tri’ = ‘three’, ‘kona’ = ‘angle, corners’, ‘asana’ = ‘posture’. Hence Trikonasana just means ‘three corners’ and the English title is Triangle Pose. 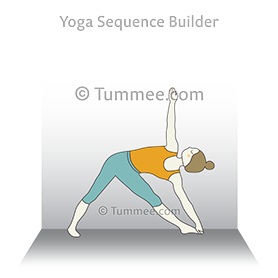 This is a standing basic beginner level yoga pose and forms part of almost all styles of yoga. A great way to open the hips, while also stretching the muscles around the spine. Compared to the practice of Utthita Trikonasana (Extended Triangle Pose), this requires more flexibility of the hips and the side abdominal muscles. Triangle Pose is considered a base pose as triangle pose variations can be derived from this pose. The below cues and yoga sequences added by yoga teachers show multiple ways to do Triangle Pose depending on the focus of your yoga sequence and the ability of your students. 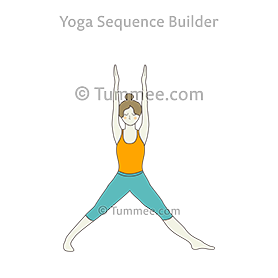 To view the complete steps and corresponding yoga sequence, please consider signing-up to Tummee.com yoga sequence builder that is trusted by yoga teachers worldwide to plan their yoga classes. Learn more. If previous pose is well balanced, try it without the chair and use a block under hand. On the exhale, reach your right hand down to the right foot and your left hand uo to the sky. On the exhale, being your left hand down to your left foot and your right hand up to the sky for Triangle pose. ~ turn your right foot out and left foot in. ~ draw the left side of your waist away from the pelvis. Straighten front leg, lower same-side arm toward the ground or your shin or a block. Back arm reaches toward ceiling. Keep hips stacked one on top of the other, don't let the upper hip lean forward. Pretend you're between 2 panes of glass. Sett foten rolig i gulv, og kom i Trikonasana på venstre side. Så finn utgangsposisjonen for beina. Løfter armene parallelt med gulvet. Forleng ryggsøylen mot venstre. Og la venstre arm gå mot gulv. Sett foten rolig i gulv, og kom tilbake til Tadasana. Vi skal i Trikonasana, så plasser høyre fot et godt steg bak. La tærene på høyre fot peke rett bak. Tærene på venstre fot peker rett til sidevegg. Løft armene parallelt med gulvet (rett ut), med håndflatene ned mot gulv. Hips: In this variation of Triangle Pose, the hand when placed behind stretches one side the hip joint while the other side flexes with compression of the hip joint and the various muscles around it. This increases the flexibility of the hip to a great extent. Shoulders: When the arms extend to reach behind the foot, the shoulders stretch more, improving the flexibility too. Alignment: Only with proper alignment can the hand be placed behind the foot and hence the focus towards the same will help with challenging yoga poses too. Advance yoga pose: The practice of Trikonasana (Triangle Pose) helps to prepare for Fallen Star Pose (Patita Tarasana), which is a deeper variation of Triangle Pose. Abdominal muscles: Trikonasana (Triangle Pose) compresses the side abdominal muscles (the side that is towards the floor), while also stretching the opposite side of the abdominal muscles deeper. Injury: Students with an injury of the back like; slip disc or disc bulge should avoid the practice of Trikonasana (Triangle Pose). Those with issues related to the knee, hips, ankles, shoulders, neck, or the abdominal area should take proper guidance from a yoga teacher to avoid further complications. Women: While women during their first trimester can practice this under the guidance of a yoga teacher, but during the second trimester and third trimester should use block for better support if very comfortable with breathing, and otherwise have no other health issues. Blood Pressure and Heart: Breathing can get difficult while doing a lateral bend especially for those students suffering from blood pressure or having heart related issues. Hence best done in a modified way and then go slowly into the complete Triangle Pose. The option of this modification can be this at Utthita Trikonasana Block (Extended Triangle Pose Block), or Trikonasana Chair (Triangle Pose Chair). Read up on the contraindications of Utthita Trikonasana (Extended Triangle Pose) also before practicing Triangle Pose. 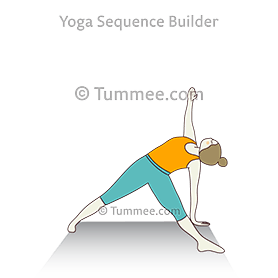 Triangle Pose Variations: Below are some common variations of the yoga pose Triangle Pose with base pose as Triangle Pose (Trikonasana). Sign-up to view all 33 variations of Triangle Pose and create your own library of yoga poses to easily and quickly plan your yoga sequences. Standing in Utthita Tadasana (Five Pointed Star Pose), take a few breaths. From here, turn the left foot outwards taking it to 90 degrees, and bring the left foot inwards taking it to 45 degrees. Inhale and extend the torso towards the left side bending gradually at the hips. Exhale, bring the left hand towards the floor and place it behind the left foot. Inhale, stretch the right arm up and as you exhale, look up at the raised arm. Inhale and keep the body loose and adjust the feet and hips to make sure the alignment is perfect ensuring the body is comfortable. Exhale to go into the pose deeper. Stay in Trikonasana (Triangle Pose) for a about 6 breaths, breathing and extending the arms and torso deeper. Inhale, and release the torso and come up to relax in Utthita Tadasana. Relax and repeat taking the torso towards the right side while extending the left arm up. Stay for 6 breaths on the right side and release to relax. Repeat again if required. We have 2300+ yoga poses with many Triangle Pose modifications along with 90000+ reference yoga sequences and cues. Please sign-up to view different modifications of Triangle Pose to plan your yoga classes and yoga sequences. Utthita Ashwa Sanchalanasana (Runners Lunge Pose). Virabhadrasana II (Warrior Pose II). Prasarita Padottanasana (Intense Leg Stretch Pose). Utthita Parsvakonasana Variation Elbow Arms (Extended Side Angle Pose Variation Elbow Arm). Utthita Parsvakonasana (Extended Side Angle Pose). Uttanasana (Standing Forward Bend Pose). Please sign-up to view level up follow-up poses for Triangle Pose. 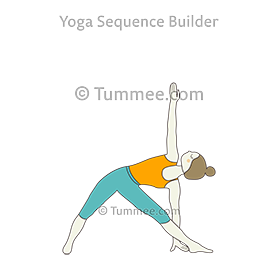 We have 90000+ reference sequences along with foundational yoga sequences built from a library of 2300+ yoga poses (with new yoga poses added daily). From Utthita Tadasana, inhale and bring the feet to 90 degrees and 45 degrees respectively. Exhale, adjust the feet and the hips. Inhale, bend the torso towards the side, reaching for the floor with your hand. Exhale, place the palm on the floor. Inhale raise the other arm up and gaze at the extended arm. Inhale and Exhale to stay in Trikonasana (Triangle Pose). Exhale, to stretch further into the posture. Inhale, release the hand and come up with the torso. Exhale, relax in Utthita Trikonasana. Follow the same instructions while practicing with the other side. Tummee.com is rated 5 out of 5 stars by yoga teachers worldwide (read 150+ 5* reviews on Facebook) and has a collection of 90000+ yoga sequences, 25000+ cues, and 2300+ yoga poses. Learn more to join your fellow yoga teachers.